Welcome to February's SCUBA News. I hope you find it useful. 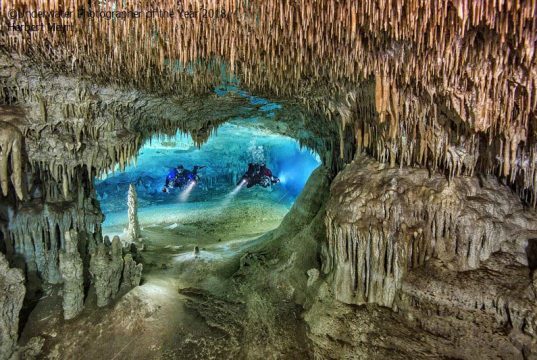 This month a reader asks for advice on choosing an underwater camera, some fabulous competition-winning photos and a Belize dive site review (no, not the Blue Hole) from "Travel Beat". We've all heard of Goa, but the better Indian diving is at the offshore islands. Albania has 418 km of coastline on the Mediterranean. The country is trying to attract diving tourists so if you fancy an little-dived area in a quiet spot give it a look. Cayman Islands: Which One to Choose? For hammerheads, melonheaded whales, dragon eels, nudibranchs plus dramatic walls and reefs. 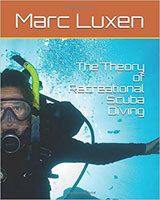 Just ran through my 1st edition of scuba news online. Fantastic, you have added so many sites to my dive list. What is the best underwater camera? I am looking at the GoPro5 Action and the Sealife compact. I don't like rigs with lighting. Any ideas? Answers to news@scubatravel.co.uk and we'll pass your message on - thanks!. Right in front of Ambergris Caye and not too far from Caye Caulker, protected from the deep blue by Turneffe Islands, lie the calm waters of Spanish Bay. Had a great time with Black Durgon Dives on Caye Caulker. by Travel Beat. You can see Beat's video of this dive site here. "Cycle War" was taken in Egypt and shows Norton 16H motorbikes loaded in Fordson WOT 3 trucks, with soldierfish schooling above. Friedrich explains "I had had this image in mind for a few years, but it is impossible to capture in one photo, because there is not space inside the wreck to photograph this scene in a single frame. My solution was take a series pictures and stitch them together as a panorama." Chair of the judges, Peter Rowlands, said "this is a quite extraordinary shot which must be viewed as large as possible. The artistic skill is to visualise such an image and the photographic talent is to achieve it." See the photo. 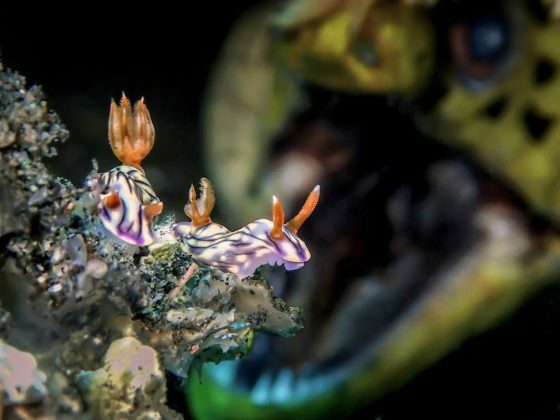 Malaysian Man BD was named as Up & Coming Underwater Photographer of the Year 2018 for his image "Roar", showing a pair of nudibranchs with the jaws of a moray eel in the background, photographed in Indonesia. "When shooting these nudibranchs I was focusing on getting the shot," explains Man, "when suddenly a moray eel appeared behind. It still took me about 30 minutes to get this shot." Shane Gross won the macro category. "The pond I was in has the highest density of seahorses on Earth, but I've never seen three together like this before. 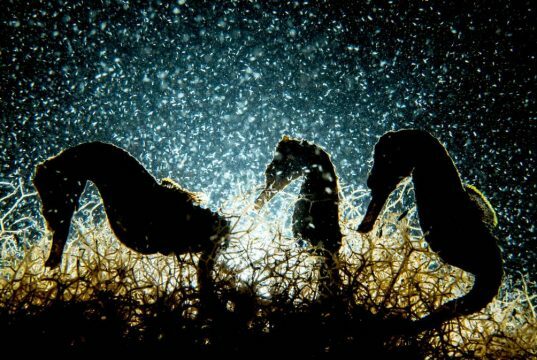 I was camping on shore and had all night to shoot with the idea of backlighting a single seahorse, but finding three together was a real gift." Underwater Photographer of the Year is an annual competition, based in the UK, that seeks to celebrate photography beneath the surface of the ocean, lakes and even swimming pools. This year's judges were experienced underwater photographers Peter Rowlands, Martin Edge and Alex Mustard. See more of the winning photos here. 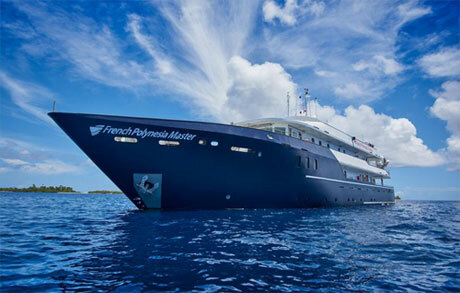 Traditional but luxurious Indonesian liveaboard, the WAOW, has been lost to fire during a storm. What if third world countries could help the oceans by turning plastic into cash? There may be a way to change the tide and remove plastic from the seas, land and lives of those who are most in need. The new whisker sensor is made of polyurethane, graphene and copper tape and can detect an underwater vortex with very high sensitivity. Commercial fishing now covers a greater surface area than agriculture, raising fresh questions about the health of oceans and sustainability of trawler fishing. Describes the most common species in the Atlantic Ocean and includes their endangered status based on the IUCN Red List. Understand what is happening and why it happens before, during, and after a dive. Tides, currents, waves, marine life, physics of diving, physiology, decompression - new book tells you everything you need to know.